Venus Legacy Now Available at Gentile Facial Plastic & Aesthetic Laser Center. Dr. Richard Gentile a board certified Facial Plastic Surgeon with offices in Youngstown, Akron and Cleveland Ohio is pleased to announce that we are the first Plastic Surgery Center in Northern Ohio to offer the exciting new aesthetic technology from Venus Technologies…Venus Legacy featuring Lift FX and Sculpt FX. Venus Legacy takes up where Venus Freeze left off and features some excellent new features. As Dr. Gentile notes, We are exciting that we can measure real time temperature in the tissues treated and that the treatments are pain free. 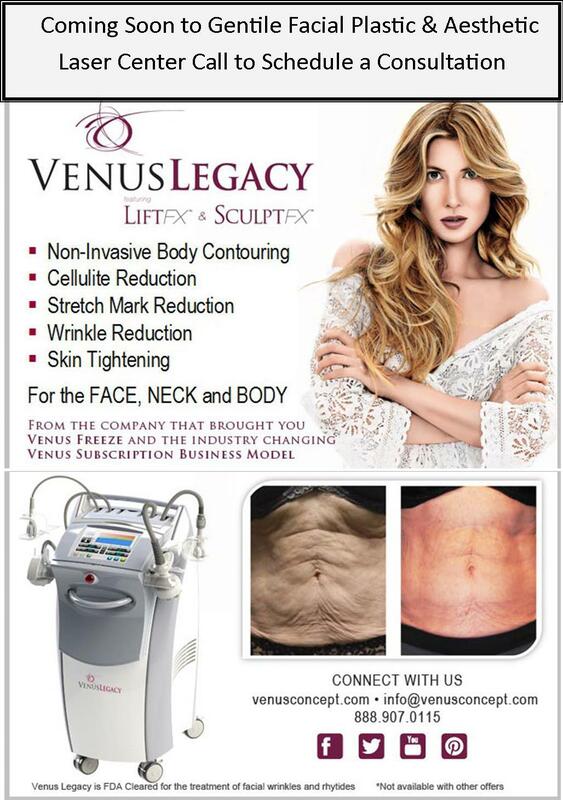 Venus Legacy is a single aesthetic workstation for non surgical body contouring, cellulite reduction, stretch mark improvement and skin tightening for the face neck and body. It is the first and only FDA cleared technology to use a combination of Multi-Polar Radiofrequency and Pulsed Electromagnetic Fields. Legacy offers tow new treatment applicators called SculptFX and LiftFX both utilizing the enhanced Venus 4D technology combining RF+PEMF=VariPulse+Real Time Thermal Feedback, which is designed to deliver safe, pain free treatments and superior outcomes. For more information on Dr. Gentile and his practice in Cosmetic & Laser Surgery including the treatment of Acne Scarring, Smartlipo TriPlex LaserBodySculpting , Cellulaze, LaserSmartLift, TickleLipo, Venus Legacy, Thermi RF or to schedule a consultation with Dr. Gentile please call the office at 330-758-2001 or visit www.faciaplastics.org.